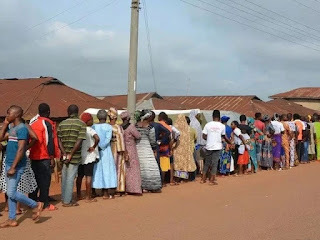 Electorates in Ado Ekiti, on Saturday, came out as early as 6.00am trekking long distance to get to their various polling units. Some have trekked as long as five kilometers to be able to vote for the candidates of their choice. The large turnout is believed to be largely due to high mobilization by the two dominant parties - All Progressives Congress and the Peoples Democratic Party. units in those areas already having long queues of voters. As at 6.45am, security and election materials were already seen arriving in those units. Some voters trekked from hamlets located at Eminrin and Erunfun located along Afe Babalola University way in the state capital to the heart of Ado Ekiti just to make sure they exercise their franchise. Today’s election will be a straight fight between Dr. Kayode Fayemi of the APC, and Prof. Kolapo Olusola of the PDP. Massively on the que to align with the APC led government! Massive result at the end of the day for the APC. Let's warm up for President Buhari's victory in 2019.